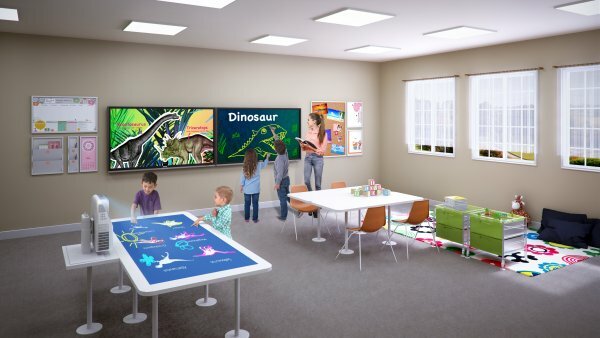 BenQ has unveiled BenQ RM5501K interactive educationpanel display along with pioneering products including laser projectors, digital signages and dustproof projectors for various segments. The RM5501K education interactive flat panel offers a streamlined and ultra-smooth handwriting experience that can effectively enhance class interaction and student participation. The RM5501K offers dual pens for simultaneous collaboration with two different colors that allow two users to write or draw with different colors simultaneously, making it ideal for lively classroom activities. Additionally, it offers flexible display of brush mode for creative education with the capability of naturally displaying different stroke thickness based on different types of tools used to write or draw on the screen, offering educators and students a more natural writing experience. It is capable of detecting strokes created with fingers, the IFP stylus, watercolor brush or even pencil. This panel is TÜV-certified with low blue light technology and flicker-free technology. Blue light emissions from displays may cause adverse health effects such as macular degeneration or disrupted melatonin secretion. BenQ’s Low Blue Light technology minimizes blue light exposure and allows for healthier time spent in front of the display. Additionally, RM5501K’s anti-glare glass surface can effectively reduce reflections, freeing students from excessive squinting with more legible text and clearer images, avoiding eye strain and facilitating more effective instruction. The RM5501K’s handwriting recognition feature allows presenters to simultaneously convert written text, numbers, forms, and drawings into legible materials without having to switch modes while effectively facilitating smooth teaching flow. It offers wireless solution for seamless collaboration and facilitates teaching flow with friendly design. It has front-facing speakers and external microphone compatible for more impactful learning. RM5501K repositions the 20W audio speakers to the front, offering better sound transmission that elevates the level of audio-visual enjoyment during classes. Additionally, RM5501K comes with a Mic-In port that allows teachers to connect external microphones, further facilitating an impactful and effective learning experience for students. It is an instant Plug and Play device and can be connected to a PC via USB.